Cairo - U.S. Vice President Mike Pence’s upcoming visit to the Middle East comes at a time of intensely publicized friction between his administration and the Palestinian leadership, posing a dilemma for his Arab hosts — Egypt’s president and Jordan’s king — on how to safeguard their vital ties with Washington without appearing to ignore Palestinian misgivings. It’s a tall order given that Pence is visiting at a time of rising anti-U.S. sentiments in the region, stoked by President Donald Trump’s recognition of contested Jerusalem as Israel’s capital. The city is home to major Muslim sites, along with Christian and Jewish shrines, and its Israeli-annexed eastern sector is sought by the Palestinians as the capital of a future state. Pence was to have visited the region in mid-December, but rescheduled as Trump’s dramatic policy shift on Jerusalem just a few days earlier triggered Arab condemnation and region-wide protests. At the time, Abbas said he would not receive Pence in the biblical city of Bethlehem, as originally planned, and the spiritual leaders of Egypt’s Muslims and Orthodox Christians — Al-Azhar’s Grand Imam Ahmed al-Tayeb and Tawadros II respectively — also canceled their meetings with him. 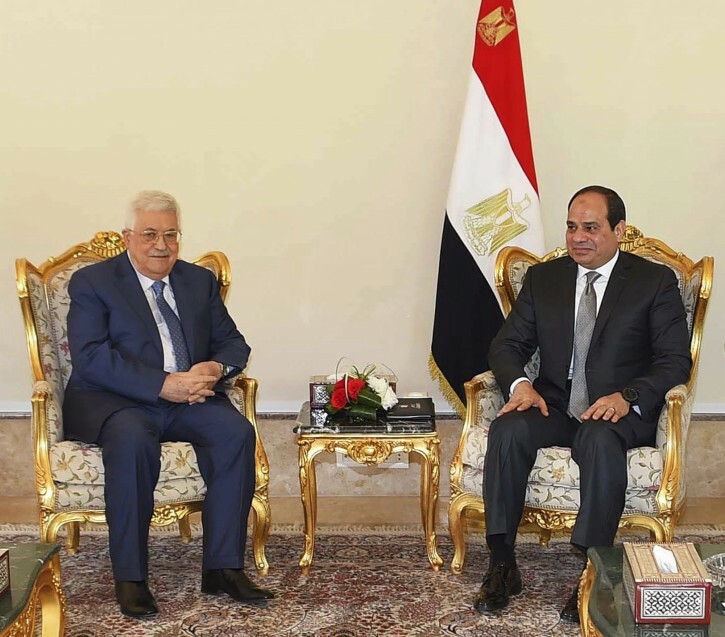 Egypt’s president, Abdel-Fattah el-Sissi, reassured Abbas on Wednesday of Cairo’s continued efforts to secure an independent Palestinian state with east Jerusalem as its capital, according to a statement by presidential spokesman Bassem Radi. That may in part have been designed to put to rest the fallout from a New York Times report last week which claimed that while Egypt publicly condemned Trump’s Jerusalem decision, it privately supported the move. El-Sissi has repeatedly appealed to Trump to be more involved in the fight against Islamic militancy in the region. With his security forces struggling to contain an insurgency by an Islamic State affiliate in Egypt’s Sinai Peninsula, the general-turned president will show little willingness to allow anything to diminish what he sees as a strategic alliance with Washington. Sounding a realistic note, Abbas aide Ahmed Majdalani said the Palestinians did not expect Arab countries to follow suit in their strong response to Trump’s Jerusalem’s decision. At the same time, he explained, they don’t believe the Trump administration will win support for any peace plan that weakens Arab ties to Jerusalem. Still, Jordan’s king faces a particular conundrum, as U.S.-Palestinian ties deteriorate. Palestinians make up a large segment of his country’s population. His Hashemite dynasty largely derives its political legitimacy from its historic role as custodian of Jerusalem’s main Muslim shrine, the Al-Aqsa mosque, which is Islam’s third holiest site. Any perceived threats to Muslim claims to the city, such as Trump’s shift on Jerusalem, undermine its vital role there. Over the years, Abdullah has tried to soften continued domestic opposition to Jordan’s peace treaty with Israel, struck by his father in 1994, in part by offering his services as mediator on behalf of the Palestinians, in dealings with Israel and the U.S.
Pence’s meeting with Abdullah on Sunday follows a series of anti-U.S. protests in the kingdom — including some organized by Islamists. Musa Shteiwi, director of Jordan University’s Center for Strategic Studies, said Amman cannot afford to disengage from the U.S. But, he explained, Pence needs to “carefully listen” to what U.S. allies are saying about the risk involved in Trump’s Jerusalem decision. In contrast, Pence can expect a warm welcome in Israel, whose hard-line government is one of the Trump administration’s biggest supporters on the international stage. Trump has adopted a series of decisions seen as sympathetic to the Israeli government, distancing himself from the two-state solution favored by the international community, expressing little opposition to settlement construction and most recently, recognizing Jerusalem as Israel’s capital. Pence’s visit will be highlighted by an address to Israel’s Knesset, or parliament, an honor rarely accorded to visiting dignitaries. When Trump recognized Jerusalem as the Israeli capital, he insisted that it did not preclude Palestinian claims or the city’s future borders. But the Pence visit, particularly if he refers to the area as being Israeli, will deepen the Palestinian suspicions that Trump has sided with Israel on the most sensitive issue in the Israeli-Palestinian conflict.